Soak in the sunshine when you attend these Chamber member holiday events for the whole family to enjoy. Itching for a fun outing with friends and family this holiday season? If you’re planning on staying in the Valley you’re in luck, Phoenix happens to be home to a number of exciting attractions that are sure to engage any audience. This season, Chamber members including the Heard Museum, the Phoenix Zoo, the Desert Botanical Garden and the Arizona Science Center are helping patrons create cherished memories with loved ones. Don’t miss Holidays at the Heard starting Monday, Dec. 26 continuing through Friday, Dec. 30. Guests are invited to experience American Indian Music, dance performances and artist demonstrations at the Heard Museum while enjoying delicious fry bread and fry bread tacos every day. Join the Phoenix Zoo in celebrating 25 years of ZooLights, the Valley’s brightest holiday tradition presented by SRP. From now through Sunday, Jan. 8, 2017, the Phoenix Zoo will be illuminated nightly with millions of lights, featuring a three-story lighted tree, lakeside motion-in-music shows and much more. Save on admission when you purchase tickets online. If you’re looking for an exciting way to ring in the new year with the whole family, join the Phoenix Zoo’s Noon Year’s Eve celebration. Perfect for those who can’t stay up all night, this celebration happens 12 hours early and festivities include 30 tons of snow, a noon ball drop with cider or juice to toast, music, dancing, prizes and one of the final opportunities to view Nature Connects®: Art with LEGO® Bricks. 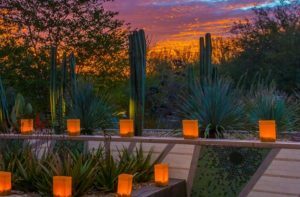 Take advantage of Phoenix’s perfect winter weather when you visit the Desert Botanical Garden’s (DBG) Las Noches de Las Luminarias event. Stroll through the garden as 8,000 hand-lit luminaria bags and thousands of twinkle lights set the garden aglow while live music fills the air and you enjoy dinner at the DBG’s onsite restaurant Gertrude’s. If theatre is more your style, check out “A Winnie the Pooh Christmas Tail,” an annual holiday tradition presented by the Valley Youth Theatre. Kids will love seeing stage incarnations of Christopher Robin, Piglet, Pooh, Rabbit, Tigger, Owl, Kanga and Roo and other woodland creatures as they search for Eeyore’s lost tail. The show is presented throughout the month of December. Looking for a fun educational experience for kids and grown-ups alike? At the Arizona Science Center, everyone in your group is sure to leave having learned something new. Find answers to the age-old question: “Are we alone?” in the Alien Worlds and Androids exhibit, learn about our National Parks’ history during the National Parks Adventure film or build a snow man during Snow Week starting Monday, Dec. 26 running through Sunday, Jan. 1, 2017. You may be dreaming of a white Christmas, but there are no blizzard conditions to worry about in Greater Phoenix this holiday season. So get out there in the Arizona sunshine and attend these great holiday events! -Written by Alexie Chavez, marketing coordinator for the Greater Phoenix Chamber of Commerce.